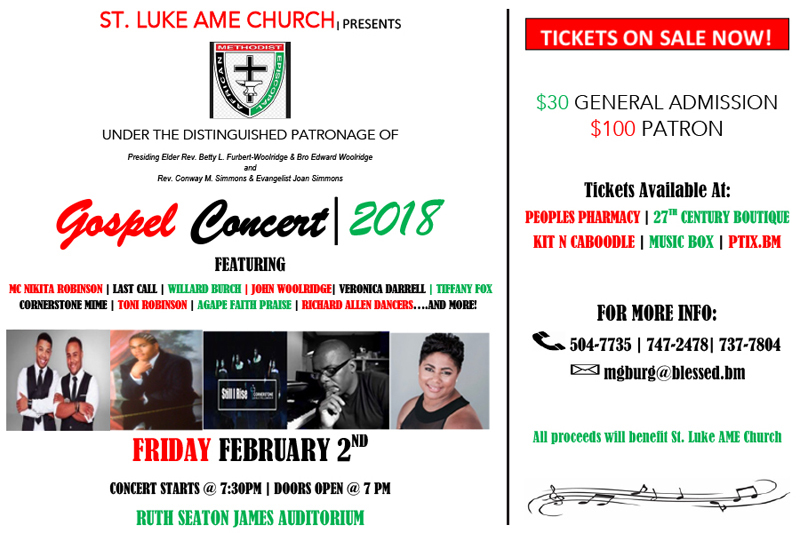 The St. Luke AME Church will be hosting a fundraising gospel concert on Friday, February 2 at 7.30pm at the Ruth Seaton James Auditorium, featuring MC Nikita Robinson, Last Call, Willard Burch, John Woolridge, Veronica, Darrell, Tiffany Fox, Cornerstone Mime, Toni Robinson, Agape Faith Praise, Richard Allen Dancers, and more. General Admission cost for $30 and Patron Tickets cost for $100 and are available from the Peoples Pharmacy, 27th Century Boutique, Kit N Caboodle, Music Box, and Ptix.bm. All proceeds will benefit St. Luke AME Church. For more information call 504-7735, 747-2478, and 737-7804 or email mgburg@blessed.bm. Sing a song for the bus drivers…sing a song for trash truck drivers.